Recombinant full length protein corresponding to Human Tryptophanyl tRNA synthetase/WRS. human normal breast tissue. HEK293 cell line. Previously labelled as Tryptophanyl tRNA synthetase. Our Abpromise guarantee covers the use of ab31536 in the following tested applications. WB 1/5000. Detects a band of approximately 53 kDa (predicted molecular weight: 53 kDa). Isoform 1, isoform 2 and T1-TrpRS have aminoacylation activity while T2-TrpRS lacks it. Isoform 2, T1-TrpRS and T2-TrpRS possess angiostatic activity whereas isoform 1 lacks it. T2-TrpRS inhibits fluid shear stress-activated responses of endothelial cells. Regulates ERK, Akt, and eNOS activation pathways that are associated with angiogenesis, cytoskeletal reorganization and shear stress-responsive gene expression. Belongs to the class-I aminoacyl-tRNA synthetase family. Proteolytic cleavage generates 2 forms; T1-TrpRS and T2-TrpRS. 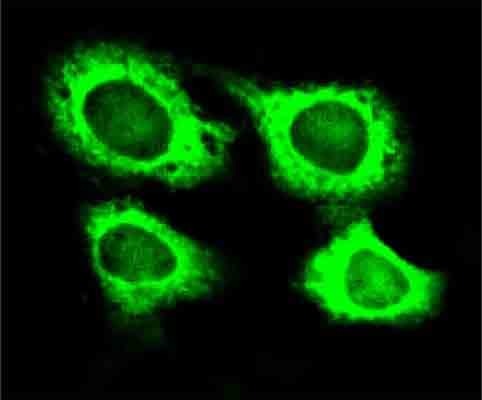 ab31536 staining Tryptophanyl tRNA synthetase/WRS in HeLa cells by Immunocytochemistry/ Immunofluorescence. Publishing research using ab31536? Please let us know so that we can cite the reference in this datasheet. There are currently no Customer reviews or Questions for ab31536.